Successfully Added Xiaomi USB Fan - USB 2.0 Interface, Flexible Silica Gel Body, 26dB Low Noise, Detachable Body to your Shopping Cart. Keep your head cool while working during the hot summer with this mini USB fan. The mini USB fan from Xiaomi has been crafted out of super soft and flexible silica gel. This allows you to twist and turn it around so that you’ll be able to aim it at the exact right spot. Simply plug it into your laptop or powerbank, and you’ll be ready to go. Your USB fan will automatically start working once it has been plugged in. 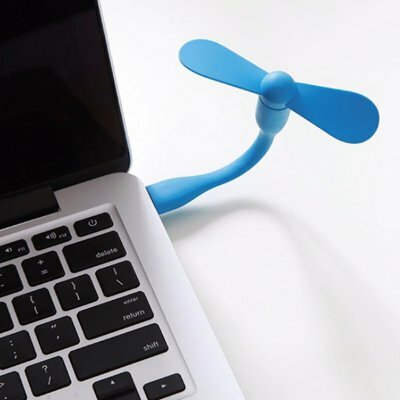 With this amazing computer accessory, you’ll be able to stay cool and fresh during the hottest of days. The blades of the fan are detachable which makes your gizmo easy to carry along in your bag. It furthermore features an extremely lightweight design of merely 30 grams. With its low noise production of just 26dB, the Xiaomi USB mini fan won’t disturb you during your tasks. This mini USB fan comes with a 12 months warranty, brought to you by the leader in electronic devices as well as wholesale electronic gadgets..